Well, at first glance IT Analyst Reports certainly seems useful. Alas, at least at the current stage, this website is less useful than a Google search. t appears that the website for IT Analyst Reports does not actually have analyst reports (e.g., Gartner Magic Quadrant or Forrester Wave) available for free download. Rather, it appears it simply scrapes newswires and PRwires for press releases by vendors on their placement on a report. The visitor to ITAnalystReports.com then needs to click on the link to the press release in order to click to the vendor’s webpage where the vendor has hosted the report. If the vendor has not actually purchased reprint rights then the report is not available so clicking to a press release can be a waste of time. In addition, some of IT Analyst Reports scraped “articles” are actually just summaries with no links to the actual press release or vendor website. Click on graphic on the right to see an example. not only brought up a way to get the current report for free, but the 2007 version of the MQ as well. Very useful because now I can see what has changed between the 2007 and 2009 versions. However, the advice you get for free is often only worth what you paid for it. It is very important that technology buyers do not simply rely on an analyst report, free or purchased. This is because valuable context is often missing from short research notes. To learn more see IT managers, it’s never, ever only about the upper right dot when it comes to Forrester Waves or Gartner Magic Quadrants. 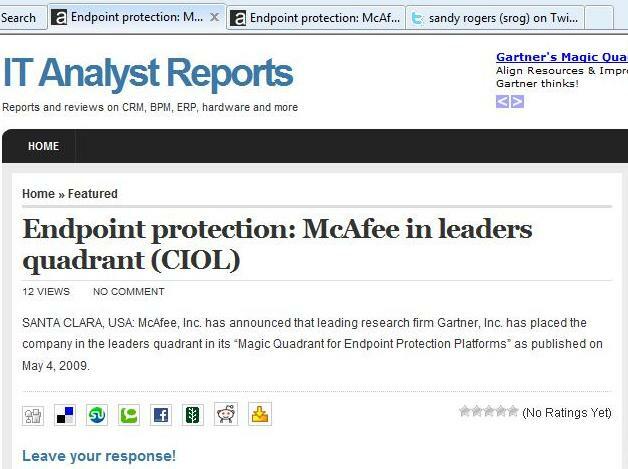 Bottom Line: Gartner’s Magic Quadrants and Forrester’s Waves are the most widely available research reprints. It is easy to find almost any MQ or Wave through a simple Google search. … or look at Malcolm Ramsay’s customised Google search at http://www.alltheanalysts.com/ which had a few problems recently but is now back online.